When a potential donor taps a band worn by a supporter with an NFC phone, they are directed to a fundraising page from which they can instantly make a donation. A QR code is also printed on the wristband for donors without an NFC phone. 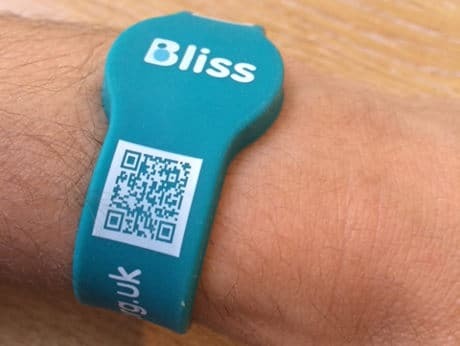 The wristbands “make it that much easier for fundraisers to secure sponsorship and donations from their friends, family and colleagues right then and there at the moment of asking,” says Alaric Shorter, events manager at Bliss. “The wristbands are uniquely programmed with the fundraiser’s JustGiving, VirginMoneyGiving, or any other fundraising platform page,” Rupert Englander, managing director of wristband supplier Wooshping explained to NFC World+. Well done Rupert at Wooshping!